Infibeam IPO Review - Should We Invest in Infibeam IPO? India's First Ever eCommerce IPO, Infibeam IPO is all set to hit stock market on 21st March, 2016. Yes, Infibeam is india's first ever eCommerce website which is going for IPO. (not first internet comapny, earlier we had Rediff, quick heal, just dial, 99Acers etc who raised money from IPO). This is not usual way of raising fund in internet vally. Most of the start ups raise money via venture capitals or angle investment. Like Flipkart and Snapdeal who goes via Venture capital investment to raise funds for their comapny. In VC funds, companies sell percentage of stock to VCs and raise some funds for their start up. But Infibeam going via different way to raise money. After SEBI given green signal for Infibeam IPO in October,2015 company decided to go for IPO this march, 2016. For IPO lunch infibeam has hired SBI Caps and Elara Capital to manage their IPOs. Infibeam IPO Details :- Infibeam is looking forward to raise Rs.450 crore via Infibeam IPO. The Current valuation of Infibeam is Rs.2237 crore. The Price Band is Rs.360-432 per share. Money will be spent on :- Infibeam will build new could data center, get new corporate office, for corporate purpose fund needed and planning to open 75 new logistics centres in india. Current Investors in Infibeam :- Bennett, Coleman & Co Ltd had invested Rs.33.3 crore for 1.8% stack in infibeam. Profit/Loss :- Infibeam has reported Rs.171.27 crore of profit in the year 2015 (April-September, 2015). But Last year Infibeam has reported Rs.10 crore of loss. Statistics :- Infibeam has currently 5000+ registered merchants and 7.8 million active Users. Other products :- Apart from Infibeam.com, Infibeam also owns BuildAbazaar.com B2B Business portal which has 50k registered merchants. Apart from BuildAbazaar, infibeam also owns Indent, Incept and Picsquare. As we know that infibeam has not gone for big fund raising in past, than till date how infibeam was operated. A Gujarat based business family is backed infibeam, who is toyota car dealer (Infinum motors). Should we invest in Infibeam IPO? 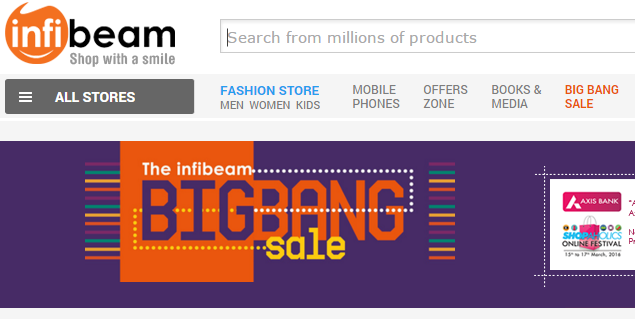 Infibeam one of the big online shopping website, was founded by Vishal Mehta in 2007, who was former Amazon Employee. And currently looking forward to fight one on one with Flipkart, snapdeal and Amazon to get more eCommerce business in india. If we go buy past records, infibeam does good business despite having low fund. 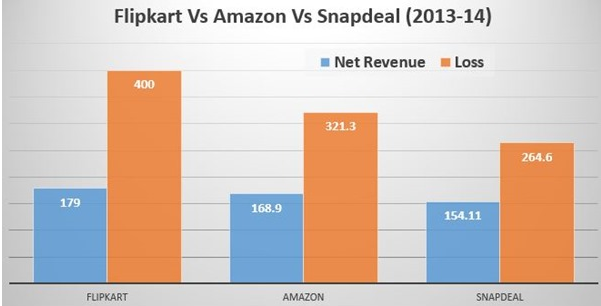 They have big competitors like Amazon and flipkart who got tons of fund and still reported not making any profit. Below is comparison of Flipkart Vs Amazon Vs Snapdeal, about their revenue and losses. And now they got another big competitor Paytm, who is making good profit in this category. With price band of Rs.360-432 per share, which is looking overpriced but looking at internet business boom, there are chance that infibeam gets good business after having fund to spend on advertisement. If you have good money to invest on, than you can go for infibeam IPO but small investors should stay away from Infibeam IPO. After Infibeam IPO, we have Makemytrip, homeshop18,Flipkart and Bharat Matrimony also going for Public IPO next year.